Old restored wooden buildings at the historic fishing site of Battle Harbour (harbor) in Labrador. 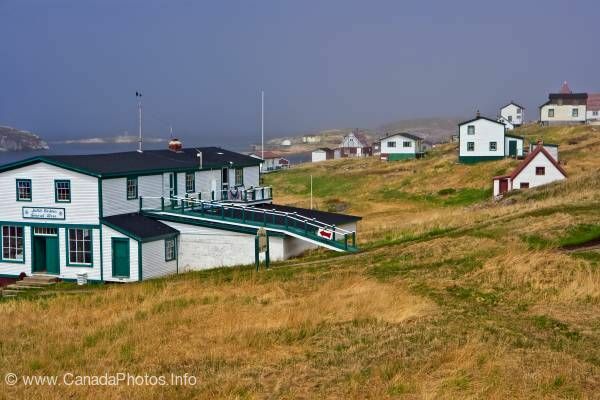 General Store and homes in the historic fishing village of Battle Harbour situated on Battle Island at the entrance to the St Lewis Inlet, Viking Trail, Trails to the Vikings, Southern Labrador, Labrador, Atlantic Canada, Canada. Battle Harbour operates from mid June until mid September (depending on pack ice and weather conditions). A Fishery was established around Battle Harbour in 1770 which was followed by the first permanent settlers in 1775. The Cod fishery (mainstay) was discontinued in 1991 and many people abandoned their properties on the island. In 1992 restoration work of the buildings begun by the Battle Harbour Heritage Trust - now called Battle Harbour Heritage Properties.